I spent an enjoyable Sunday in early June 2018 looking through the groves along the Avenue of the Giants, including Bolling, Kent, Federation, and Founders Groves. 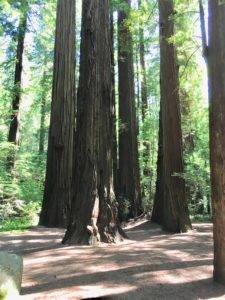 There were a series of tall trees I wanted to locate in each of these groves and was successful, combining older clues involving groves and tree descriptions with newer information available on Open Topography LiDAR portal. 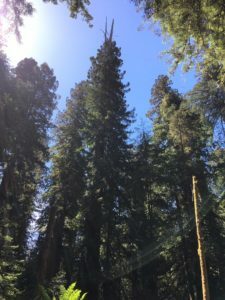 Finding the trees became a test of GPS navigation and inference, with a bit of range finder height measurements to confirm certain tall trees. The Bolling Grove sits right by the Avenue. 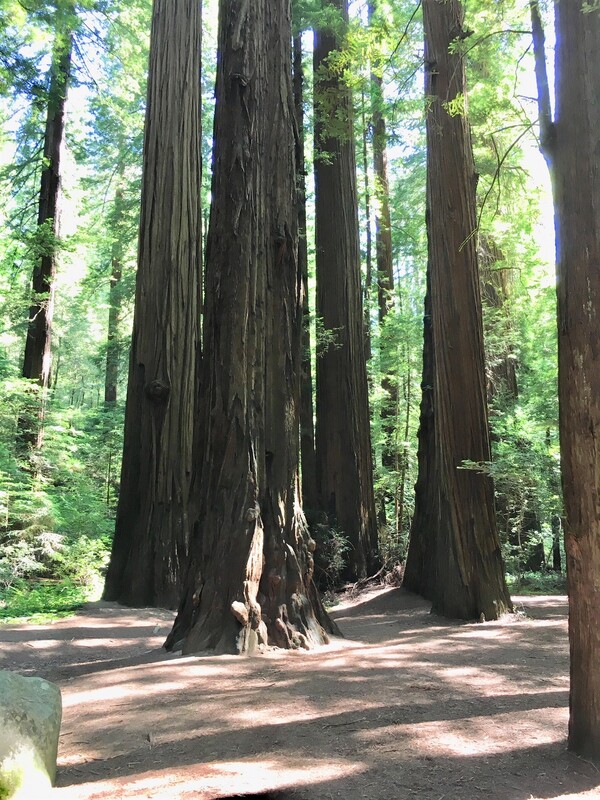 The area of tall trees is very small, and the trunks are arranged in a pleasant pattern that recalls a sculpture garden. Three of the four trees in the main grouping are over 100 meters. Here you can see the rendered LiDAR point cloud data, where purple is 105 meters in height and red is 100 meters in height. Then you can compare the LiDAR with the photo of the tree grouping. The one in front is 100 meters, then the ones to back left (Bolling Stovepipe) and back right have crown points above 105 meters. The grove is dedicated to Colonel Raynal C. Bolling who was killed in action 100 years ago (March 2018) during World War I. 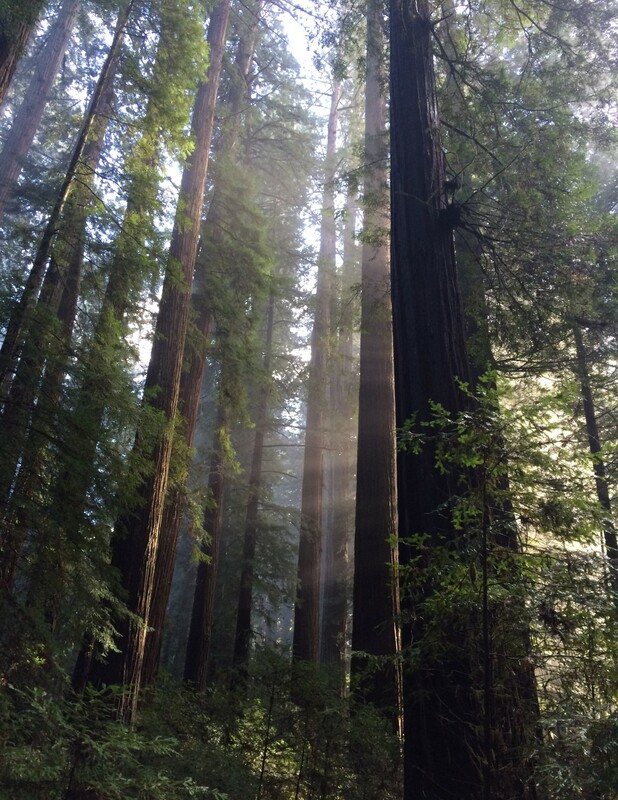 A little later in the day I hiked the Founders Grove trails. There are many great trees all over this grove, with 200 or so trees in the grove over 100 meters in height. 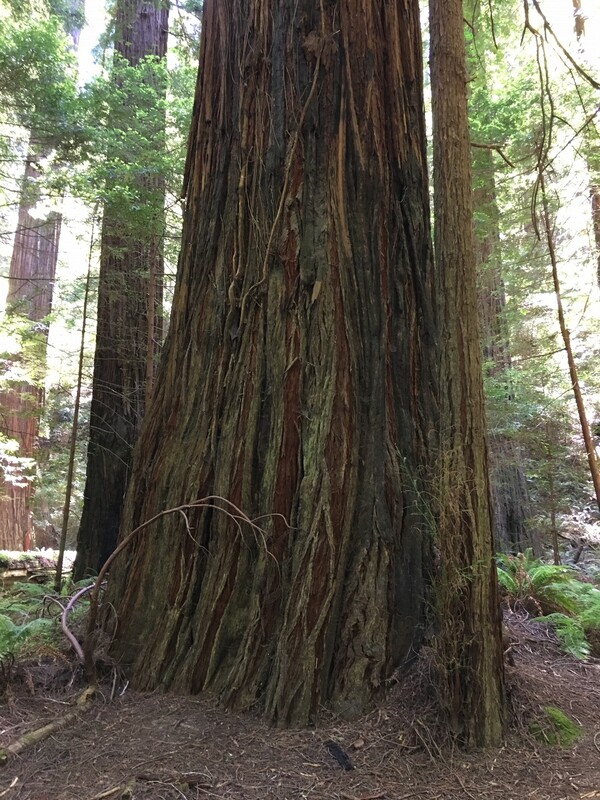 Here is one of the tall trees in Founders Grove, aptly named Javelin. Sure you can see why. 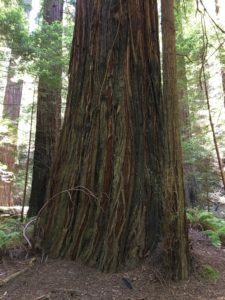 A few days later in the same week I did some group hikes in Jedediah Smith Redwoods State Park, near Route 199 in the Walker Road area. There are nice flats in this area with a good number of 100 meter plus redwoods. I believe this area has the northernmost 100 meter coast redwood trees. The loop trails along Walker Road are really nice. The amount of western hemlock is amazing, they grow everywhere on everything. 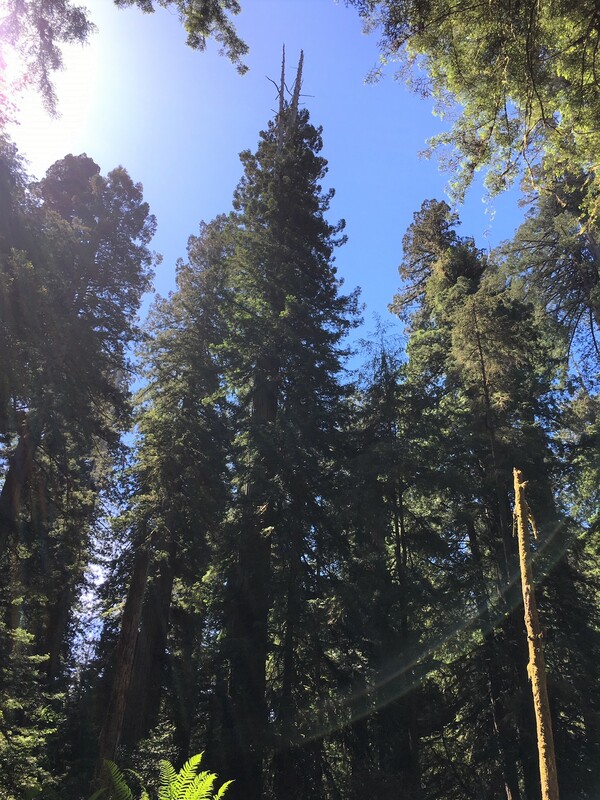 Here are a couple tall trees in the area, both well above 100 meters. The bench was built in 1972 as a viewing point to the second tree pictured. Its trail is no longer maintained but still gets a lot of use. I will post more about this trip later. Thanks for reading. There’s still a few more acres waiting for you to explore !! One discovery possibly still waiting, would be an albino redwood in Oregon. I have never heard of one. But if Jedediah Smith has one, which it does, it’s believable that Oregon could have a northernmost albino redwood. That would be a good discovery, for sure. 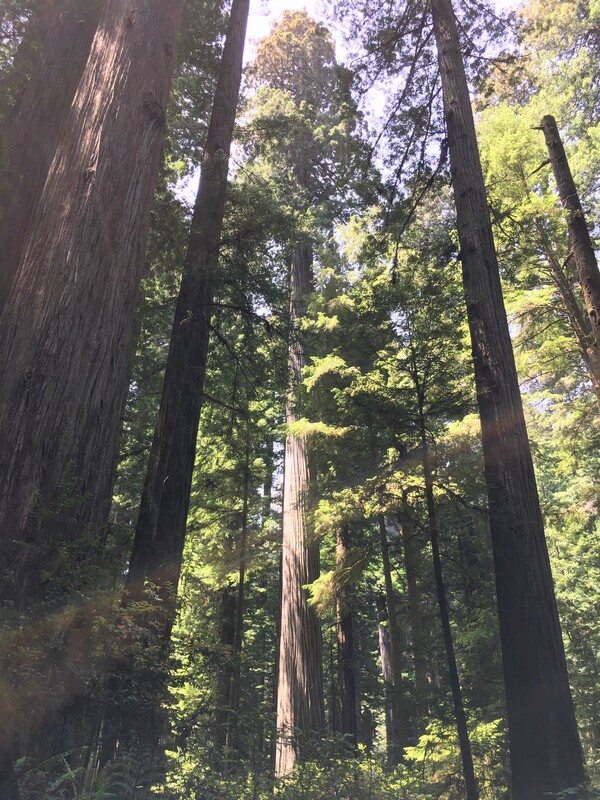 Mark, you’re doing a lot of great work exploring, documenting analyzing, interpretating and extrapolating the domain of our great coastal redwood forests. For a guy so new to that task – just over four years in – it’s amazing. I so vividly recall that very first and very wet day together, in September 2014, when you and I plunged head-first into an unsuccessful search for both ‘Hyperion’ and ‘Icarus’. Despite the fact that we paid the price and were soaked to the bone from the torential rain in both the Lost Man and Little Lost Man Creeks canyons, we survived and became very good friends. 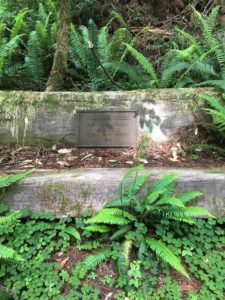 Thank you, Mark, for that, for the other forest adventures we did together, and for your extreme dedication to the understanding, appreciation and survival of our great California coastal redwood forests. Thanks for the kind words, my friend. What I have here is maybe 10% of the information you provide on your web site redwood-ed.com but it is a start. 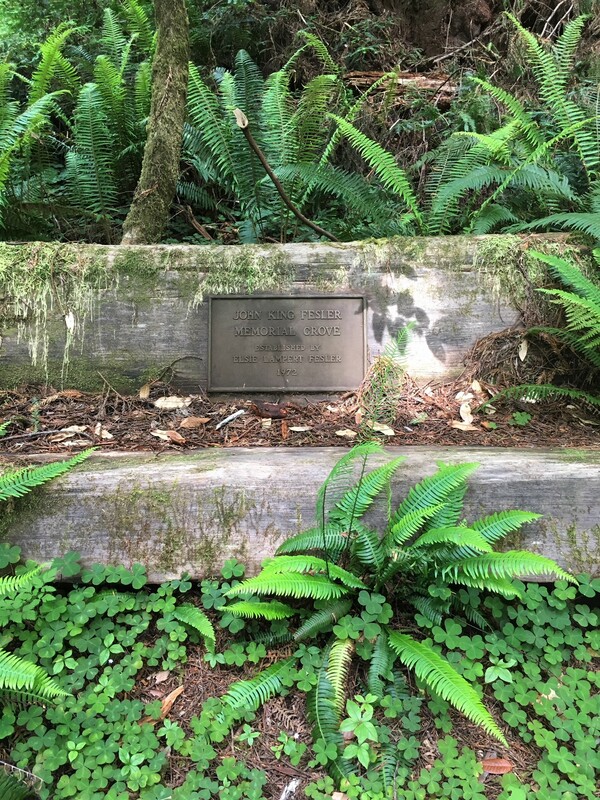 I remember those two hikes in September 2014, we were all over those creeks, way high near Lady Bird Johnson Grove and also down near Highway 101. It was thrilling hiking, I remember thinking I had never seen so much green.